One of the interesting decisions new general manager Ryan Pace will face this offseason is what to do with Alshon Jeffery. Jeffery has one year remaining on his rookie deal, a time when many players sign their first big extension if they have already proven to be quality performers that the team wants to lock up for their prime. Jeffery certainly qualifies after combining for 174 catches, 2,534 yards, and 17 touchdowns the last few seasons. So at first glance, locking up Jeffery to a long-term extension makes absolute sense, and I’m sure Pace will have discussions with Jeffery’s agent about an extension this offseason. What will be important in those discussions is how much money Jeffery’s side asks for. He could look at Brandon Marshall’s deal from last year, which averages $10 million a year and guaranteed $22.3 million, as a baseline. The Bears could point out that Marshall was a more proven receiver than Jeffery at the time of extension, but Jeffery can counter by pointing to the fact that he is much younger, meaning the team would be paying for his prime instead of later years. The ideal contracts Jeffery’s side will likely try to compare to are those of Mike Wallace, Percy Harvin, and Dwayne Bowe. These were all signed by players around Jeffery’s age by players less accomplished than Jeffery, and all have an average salary of $10.7 million or greater with a large amount of guaranteed money. Of course, two of those three contracts were given in free agency rather than re-signing with your own team, and deals tend to work higher in free agency. Bowe, the only player who re-signed with his current team, was an impending free agent, so he had more leverage than Jeffery, who has one year left on his contract. The closest comparisons to Jeffery’s situation in the NFL recently have been Victor Cruz and Antonio Brown. Both signed extensions with their current clubs with one year left on their rookie deals. Brown signed a 5 year, $42 million deal with $8.5 million guaranteed before the 2012 season, while Cruz signed a 5 year, $43 million deal with $15.6 million guaranteed prior to 2013. Jeffery is more proven than Brown was at the time of his signing, and that deal was 3 years ago. Cruz is a closer comparison, as both players had similar numbers prior to their extensions, so we’ll use that deal as a baseline. The 2013 NFL salary cap was $123 million, while 2015 is expected to be $140 million. Adjusting for inflation, we’ll approximate a Jeffery extension to be somewhere in the neighborhood of 5 years, $49 million, with $18 million guaranteed, though it could end up higher than that. Add in the remaining 1 year and $1.5 million remaining on Jeffery’s rookie deal, and that means his total contract for the Bears would be roughly 6 years and $50 million. This is a fairly conservative scenario, as I would not be surprised to see that sneak closer to $10 million a year than the $8.3 million per year that estimate provides. 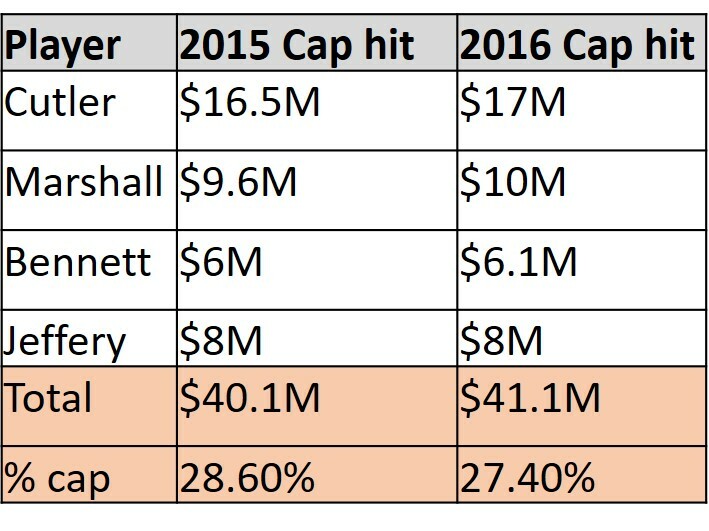 There are a number of ways you can structure a deal, which could be back-loaded to keep early cap numbers low, but let’s assume Jeffery’s contract has roughly an $8 million cap hit in both 2015 and 2016. Now let’s factor in the cap hits of Jay Cutler, Brandon Marshall, and Martellus Bennett to see how much money Chicago would have invested in their primary passing game components for the next 2 years (using estimated cap figures of $140 million for 2015 and $150 million for 2016). That’s an awful lot of money when you consider that the best Chicago’s passing offense can reasonably be expected to be at that point is a lower-level top 10 passing attack. No matter how high or low your opinion of Jay Cutler, he is never going to perform at a top 5 level in the NFL, so you’re paying huge money to have good but not great production. Is that a reasonable path to team success? That is what Pace must balance when considering what to do with Cutler and Marshall and their contracts and how to handle Alshon Jeffery. There are massive needs on this roster that need to be addressed, and spending so much money on the passing attack may leave them underfunded. So what should Pace do? I see a number of options that will get some sort of value from Jeffery, each of which have their pros and cons. Trade Jeffery for multiple picks, spend that money elsewhere, and hope you can build a good team sooner rather than later. Let Jeffery play out his rookie deal, spend that money elsewhere this year, and face the likelihood of having to pay Jeffery more after 2015 (especially after receivers like Dez Bryant and Randall Cobb get new contracts this offseason). Give Jeffery an extension now, but backload it so the cap hits remain low until after some of those other deals are off the books and then balloon up to high levels. Give Jeffery a balanced extension now and focus on rebuilding elsewhere through the draft. Use the money freed up when those other deals come off the books to pay guys you draft now when it’s time to pay them in a few years. Cut Brandon Marshall and use that money to sign Alshon to an extension. Save the rest of your money for fixing the defense. Personally, I like option 4 the best, but that has some negative short-term ramifications that could make it unattractive to a new general manager trying to establish some job security. The only way the Bears would be likely to field a playoff team in the next 2 years under that method is if the general manager has some excellent defensive drafts to rebuild a unit that has been among the worst in the NFL the last two years.